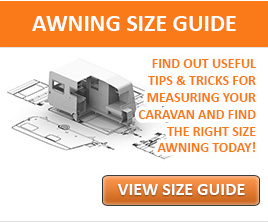 Knowing the correct size awning for your caravan is a cause of so many frustrations for you as a customer and us a retailer especially if you don’t have your manual to hand. 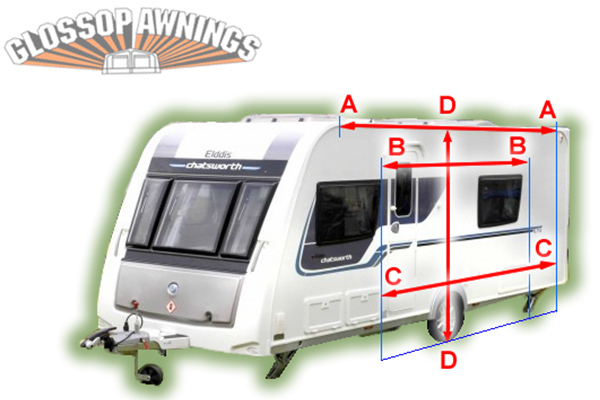 The following guide has been created to help you obtain the awning /porch that is correct for not only your caravan but for you too, especially when selecting a porch awning. If you have your manual the size for a full awning is normally listed under the Awning Size or A Measurement. If you don’t have your manual to hand, not to worry just follow the instructions below as a guide to gain the measurement required. 2. Secure string to the peg placed earlier and feed the remainder of the string through the awning rail all the way around the caravan. 3. Once your string gets to the ground at point B (Point D if Isabella or Inaca) cut the string at this point as close to the ground as possible. 4. Now measure the string and record this measurement (cm). 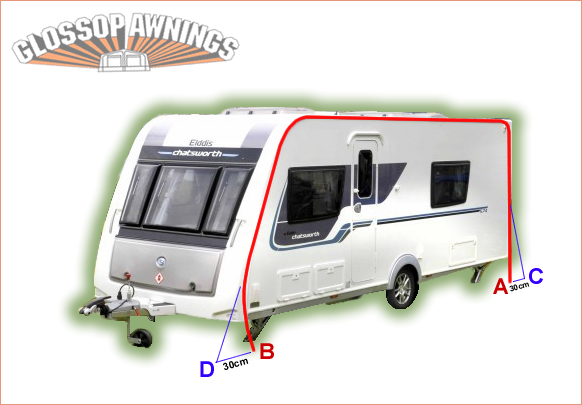 This is your actual awning size. Quite often we are asked do you have a porch to fit my caravan/motorhome. There isn’t an easy answer to this question without some investigation first. We have provided a guide below to help you assess your possibilities. Firstly you need your height range. Most porch awnings are designed to fit a standard height range of 235cm – 250cm. 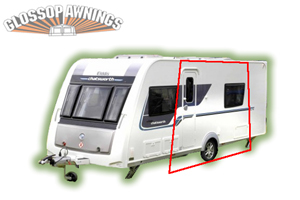 There are motorhomes and small caravans that fall outside this range which will also narrow down your choices. To measure the height, you need to measure from the floor to the awning channel at its highest points D-D.
What size of porch awning can I get? This is where it becomes a bit tricky. If you look at Points A-A this is the maximum width available as the awning channel has to remain straight for your porch to fit correctly. So Thats it right? Wrong, if you don’t mind your porch going across your windows or a Locker then yes you can get a porch up to that full width points A-A. I require a porch that doesn’t interfere with a window, then points B-B is your minimum size and C-C is your Maximum size.